Discovery: REV technicians arrived at the Wintering Hills location and began to analyze the fault records stored in the protection relays. Preliminary fault analysis helped the technicians to determine the fault type, severity and potential root causes. Description: When it was determined that the cable was the cause of the failure, REV’s technicians used a Time Domain Reflectometer (TDR) to determine the length of the cable and the distance to the actual fault itself. 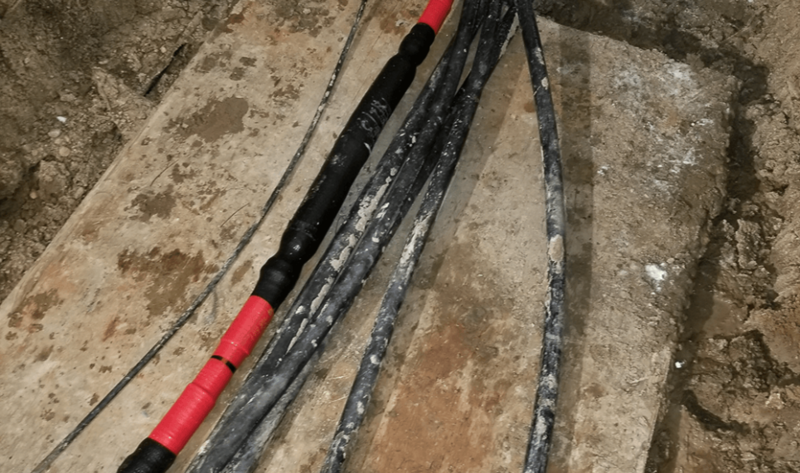 When a cable failure occurs, it becomes imperative to find the failure and repair it in order for operations to continue safely. 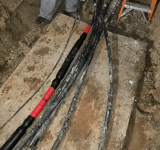 REV performs fault locating services which can be very beneficial for clients experiencing underground cable failures. As proven with a recent trip to a substation in Wintering Hills, Alberta, sometimes finding this failure is easier said than done. 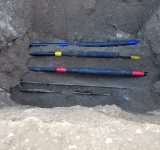 Earlier this year, REV technicians arrived at the Wintering Hills location and began to analyze the fault records stored in the protection relays. Preliminary fault analysis helped the technicians to determine the fault type, severity and potential root causes. The technicians performed all of the required safety work, such as isolation of the faulted cable, standard Lock-Out / Tag-Out / Try-Out procedures, followed by the application of protective grounds. Once the equipment was deemed safe, preliminary testing (isolation resistance and high-potential tests) was performed on the faulted cable. When it was determined that the cable was the cause of the failure, REV’s technicians used a Time Domain Reflectometer (TDR) to determine the length of the cable and the distance to the actual fault itself. An Impulse Generator (thumper) was used to send a high voltage pulse down the cable in order to cause a ‘flashover’ at the failed section of the cable. While the use of the thumper is effective and necessary, it is a destructive test that can result in the accelerated weakening of other potential weak points (insulation defects, splices, terminations, etc.) in the cable run. Despite the risks, the use of the thumper and TDR is one of the more effective ways to determine the location of a fault on a damaged cable. REV’s technicians allowed the thumper to run automatically while they walked the length of the cable in the presumed faulted area, while listening for the characteristic ‘thump’ sound produced by the thumper. They used an electromagnetic/acoustic listening device to successfully find the fault, and exposed the cable at this section to be repaired. 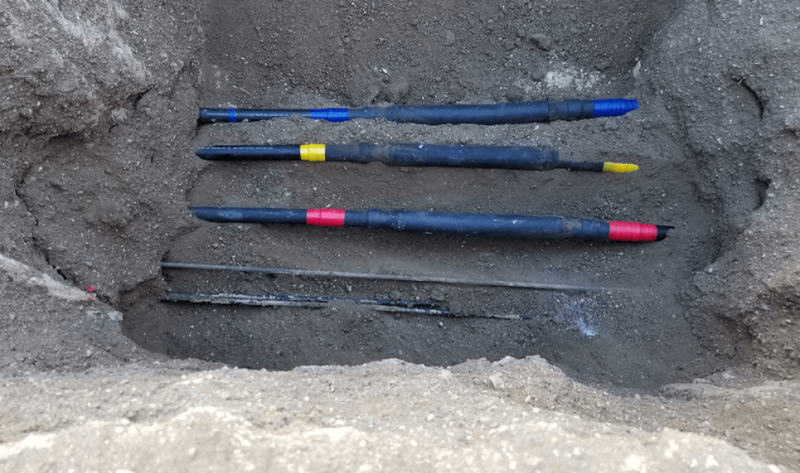 The faulted section was then cut out of the cable, and testing was performed on both remaining cable sections in order to verify that no other faults were present. Once it was determined that the cable sections had no other faults present, our technicians performed the required splicing. Upon completion of splicing, additional testing was performed on the cable by means of Very low Frequency (VLF) high-potential testing. For shielded power cables, additional diagnostic tests such as Tangent-Delta (TD) were performed to establish a baseline of the cable insulation condition. If the cable had been observed to withstand the applied tests, the cable would have been re-energized and the power would be successfully restored. It was determined that the medium voltage (35kV) underground cable run was approximately 8km long, making it extra challenging to find. We are incredibly proud of the hard work that our technicians put in to troubleshooting this problem and lengths they will go to always ensure that the job is done right.